In this IPL season, it looks like the whole country is busy with the on-field and off-the-field shenanigans of national and international cricketers. There are numerous considerations in the selection of players to represent the nation: performance, age, regionalism, favoritism, and nepotism. Yesterday, I read a piece in the Pakistani newspaper, Dawn, about the politics behind the selection of cricketers for the Pakistan national team. Pakistan cricket is probably filled with the most inspired, interesting, frustrating, amusing, baffling incidents of selection than any other country. Though consideration of religion should be far removed from the arts and sport, if not from every profession and walk of life, it is a fact that there is a clash of civilisations and religion, race, caste and colour — undeniable catalysts. Looks like there are at least a few things, apart from mutual distrust and hatred, that connect us with Pakistan. 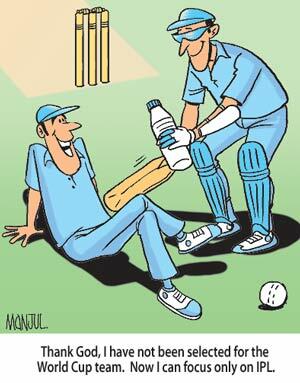 Cricket is one such thing. To read more about the politics behind team selection, click here.